PRICE: 4400 yen SRP. In the $65-70.00 SRP range when new. 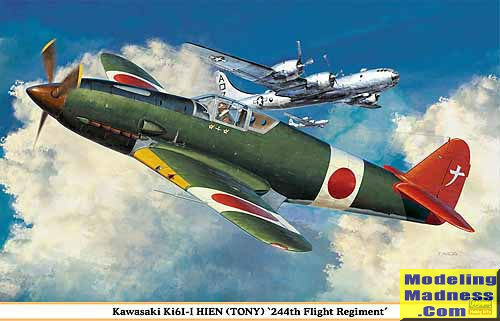 TheThe Kawasaki Ki-61 Hien (飛燕, roughly "flying swallow") was a Japanese World War II fighter aircraft used by the Imperial Japanese Army Air Force. The Allied code name assigned by the United States War Department was "Tony". The Japanese Army designation was "Army Type 3 Fighter" (三式戦闘機). It was the only mass-produced Japanese fighter of the war to use a liquid-cooled inline "V" engine. The first production version had a fully retractable tail wheel and two 2 x 7.7 mm (0.303 in) Type 89 machine guns in the wings and two synchronized 2 x 12.7 mm (0.50 in) Ho-103 machine guns in the fuselage forward decking. The wings had racks outboard of the wheel bays, which were capable of carrying one 40 gallon drop tank or a light bomb. In the second production fighter variant, it was found the armament was too light against allied aircraft and the tail wheel retraction mechanism was unreliable, the plane was modified accordingly. Two 12.7 mm Ho-103 heavy machine guns replaced the wing 7.7 mm machine guns, with modifications to the upper-wing bulges, and the tail wheel well doors were removed and the tail wheel locked in the "down" position (although the mechanism was still intact). 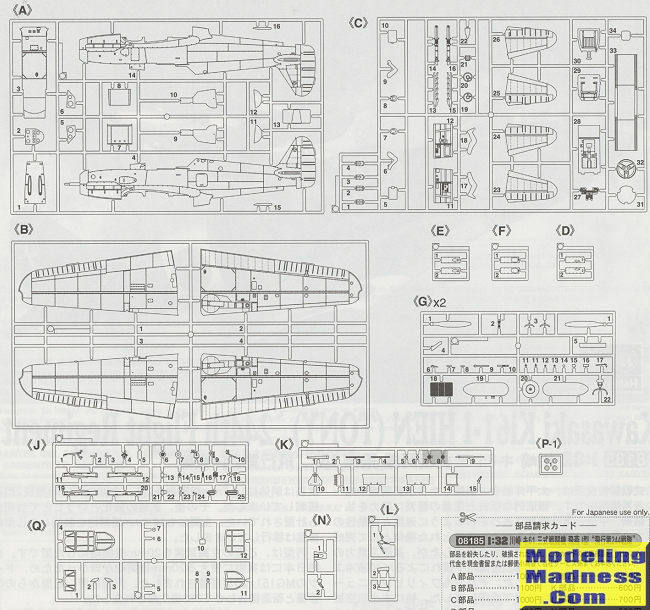 This is one of Hasegawa's limited reissues of the short nosed Ki-61-I and includes bits and pieces to allow the modeler to build three aircraft, each of which has some different bits from the other. As is the norm with Hasegawa, all the sprues save the clear ones are in one bag, making scratching and broken parts a problem. No broken bits on this one, though light scratches were commonplace. The kit includes a well detailed cockpit that for most, will be detailed enough. Frankly, the only thing Hasegawa really should add would be a seat harness. 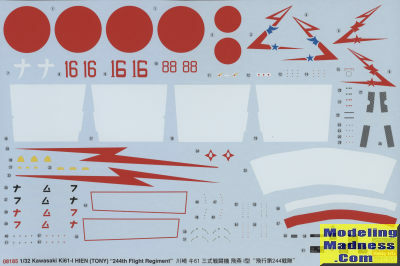 There are decals to put over the instrument panel if one wishes or one could paint and detail the individual parts. Throughout the instructions, there are notes as to holes and panel lines to fill depending on the version that is being built. There is also a note about using '..optional QG 14' for the gun barrels. No such sprue exists and I can only assume this is in reference to the original boxing that included these items in cast metal. If one wants to use the optional drop tanks, then holes need to be opened in the lower wings prior to cementing them together. To me, anything hung on the Ki-61 takes away from its sleek lines, but these tanks were often carried. There are three different upper wing bulges and two different shell ejection chutes. One of the options has long gun barrels and the larger bulges/chutes so these are either cannon or the large 12.7mm guns. The first option, which is the box art plane, has the retractable tail wheel with additional doors. It also has covers over the nose guns and does not have a radio mast. The kit includes flattened wheels which is also a nice touch as they are not widely bulged out as are some resin replacements. Hasegawa also provides a pilot figure for the kit, which may well be why there is no harness included. The last options would be for exposed steps and fuselage hand holds as well as a three piece or single piece canopy. Instructions are well done as usual with Hasegawa along with Gunze paint references. The initial offering is the box art plane. Another is an unpainted metal version with lots of mottles on the fuselage and upper flying surfaces. The third is an unpainted plane that carries the longer barrel guns. It has a big, red flash on the fuselage side. All of them have the white bands around the wings and fuselage. You may want to paint those on. Only the box art plane has the red tail. The decals are thoroughly modern with nice whites and they will react well to most setting solutions. This is one of Hasegawa's nicest big scale kits. The Tony was a very nice looking airplane and there have been quite a few nice markings applied to it. This is one of the more recent boxings (if you can call 9 years ago recent) but you can be sure that there will be more in the future. Wikipedia for the most part.